Facilities: FCI Loretto with an adjacent minimum security satellite prison camp. 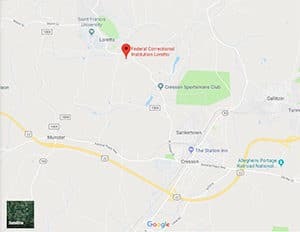 Location: FCI Loretto is located in southwest Pennsylvania between Altoona and Johnstown, 90 miles east of Pittsburg, off Route 22, between I-80 and the Pennsylvania Turnpike via Route 220. Background: FCI Loretto was formerly a Catholic seminary, which was built in 1960. The prison was opened in 1984. Notable inmates include Robel Kidane Phillipos (lied to federal investigators during the investigation into the Boston Marathon bombing), acting boss of the Patriarca crime family Anthony DiNunzio (serving 6 years for racketeering conspiracy), former New York State Assemblyman William Boyland, Jr. (serving a 14 year sentence for extortion, bribery, and corruption charges), and Rafaello Follieri (served 4 years for fraud and money laundering). Health Services: Sick call, dental call, emergency treatment, medications, chronic care, eyeglasses, physical examinations, health education on infectious diseases, HIV testing, and annual TB testing are provided at FCI Loretto. Psychology Services: Psychology services include an initial psychological screening, individual and/or group counseling, crisis intervention, psycho-educational classes, self-help, and supportive services, or referral to Health Services for psycho-pharmacological medication. Typical groups include anger management, Smart Recovery, and HIV/AIDS Awareness. Notices of upcoming groups are posted on inmate bulletin boards. Residential Drug Abuse Program (RDAP): FCI Loretto and the camp do not house a Residential Drug Abuse Program (RDAP), but referrals can be made to institutions which do offer RDAP. The facility does provide a Drug Abuse Education Course, the Non-Residential Drug Abuse Program (NR-DAP), Alcohol Anonymous (AA), and Narcotics Anonymous (NA). Education Services: FCI Loretto provides GED and English-as-a-Second Language (ESL) programs. Adult Basic Education is a program that is available for inmates who score lower than the fifth grade level on the Test of Adult Basic Education (TABE). Adult Continuing Education (ACE) courses and a parenting program are also available. High school diplomas and post-secondary programs are available through paid correspondence programs. Advanced Occupational Education: FCI Loretto offers advanced occupational education in Automotive Repair. The camp offers CDL, and both offer Personal Fitness Trainer. Apprenticeship: Both facilities offers apprenticeships in Cook and Teacher Aide. Library Services: Both a leisure and law library are available to inmates at FCI Loretto. The leisure library contains a wide variety of newspapers, magazines, listening and video tapes, and fiction and nonfiction books. There is a wide variety of reference material. The law library is electronic and provides all the required resource material. Inmates are permitted to be in the leisure and law library during their off-duty hours only. Typewriters and a copy machine are also available for inmate use. UNICOR: The FCI Loretto UNICOR facility produces electronics and plastics. Commissary: Inmates are allowed to spend up to $360.00 monthly in the commissary on items such as food, candy, snacks, drinks, clothing, shoes, and electronics (e.g., watches, radios, MP3 players, etc.). Recreation Services: The recreation facilities at FCI Loretto provide inmates with both indoor and outdoor activities. Hobbycraft activities include fine arts, ceramics, and leatherwork. The outdoor area offers a track area for running or walking. Additional activities include intramural basketball, softball, and volleyball. Special entertainment and games, contests, and holiday activities are also available. The Recreation Department is open seven days a week and accessible to inmates during non-work hours.